Basic cake cost comes with your choice of regular cake flavor from the flavor sheet and butter cream icing unless you decide to go with fondant work on the outside of the cake,or a specialty cake flavor and specialty filling price(s) will chance depending on what is decided. We Sale our cakes by the Tier not by the slice. Fondant work will be extra. Please contact us if you have any questions. Sheet cakes are covered with butter cream and scored with a rosebud or one-letter monogram in each piece, in your wedding colors. $3.00 per cupcake. 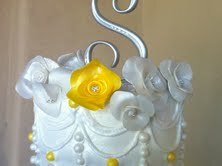 Price includes a butter cream design with a simple top decoration, which may include a small butter cream or fondant flower, or pearls, or something similar. Ordered by the Dozen(s). All wedding cake orders: When placing an order 75% of the total cost will be due at the time of placing an order, the reaming balance is due one week prior to event date.